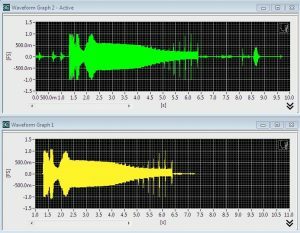 Open Loop Microphone Test (updated) – Listen, Inc.
A test sequence for measuring a microphone on a device such as a smartphone or tablet where there is no direct connection between the microphone and the computer. This specific sequence, v3, is an improvement on the prior versions. The v1 release (SoundCheck 12) required that the audio file containing the recorded response waveform be manually windowed outside of SoundCheck before being analyzed. The v2 release (SoundCheck 14) utilized a new feature in SoundCheck 14, using values from the memory list to semi-automatically trim the waveform before analysis. This v3 release completely automates waveform editing. The sequence begins by prompting the operator to enter an intersection value. This value is used to determine the start time coordinate of the recorded waveform from the DUT and in this use case it can be thought of as a Trigger Level. By default, it is set at 100m FS and depending on the ambient noise in your test environment, you may need to edit this value to capture the true start time of the waveform. (See note 1 below) Next, the operator will be prompted to begin recording on the device under test and then a stepped sine sweep is generated from 10 kHz to 100 Hz through a source speaker that has previously been calibrated to produce 1 Pascal across the sweep range. The operator is then prompted to transfer the recording to the computer and to load the file in to SoundCheck via a Recall step. At this point, a series of post processing steps automatically windows the waveform to an acceptable range for use in the remaining steps of the sequence. 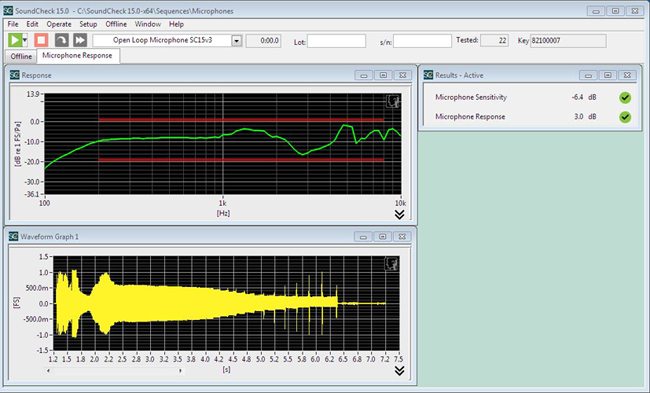 The recorded signal is then sample rate converted and frequency shifted to match the stimulus and then analyzed with a HarmonicTrak analysis step, which calculates the response curve. A post processing step is then used to extract the level at 1 kHz, the sensitivity value. Limits are set around both the frequency response and the sensitivity. The default limits values should be adapted to your particular device. The final display shows two graphs. The top X-Y graph displays the data at its absolute level in dBFS/Pa (since the imported recording is digital, the results will be in FS or dBFS rather than Volts or dBV). 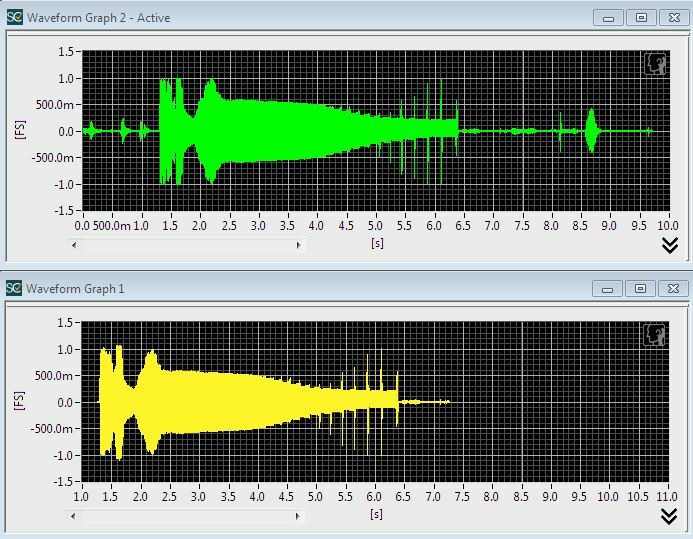 The lower graph shows the windowed recorded signal analyzed by the software. In addition the calculated sensitivity at 1 kHz and the frequency response margin is also displayed.